You join me on a recent excursion to Weston Park in Staffordshire which is one of the RH Fisheries syndicates. 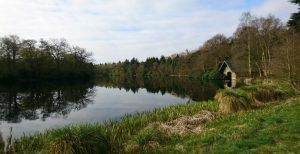 The lake was created in 1812 and is flooded with history and some very recognisable anglers have enjoyed the surroundings over the years. RH Fisheries took the lake over in 1999 and it’s a truly stunning venue with the fish to match. 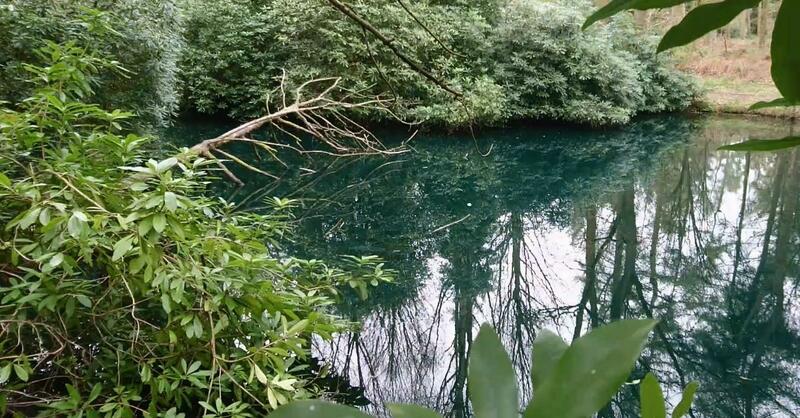 The lakes average depth is around three foot with it’s deepest area about six foot. The water is very clear and extremely weedy which can make it a challenging water at times but with many rewards. The fish on here have only recently started to become active as they’d been a bit stubborn during winter and early spring. Well for me anyway! With open access only being days away I was eager to finish the 2016/2017 season with one of these stunning residents. However, with life commitments my last session would only be a short day session. This was fine with me in all honesty as I was dying to get the stalking gear out due to a decent spell of weather. Stalking isn’t really the done thing on Weston but with a bit of etiquette very possible. I’ve been introducing the Key Cray on there since May 2016 with some fantastic results so I trickled a few handfuls around the lake well away from any other anglers. Not necessarily where I was going to try stalking but also in other areas to give them a few freebies. As much as I love stalking Carp I don’t necessarily fish the obvious places like inches from a heavily snagged area etc. Reason being it’s always in the back of my mind that I’m looking for them from where they go to get away from angling pressure and to feel safe. For me its just as rewarding leaving them to feed on your freebies and allowing them to do general Carpy stuff in the peace and quiet of their safe area. However, should they venture out to a more open area that’s where I feel more comfortable angling for them. Not everyone’s approach but that’s mine on here as you can spot the same fish so many times on Weston its almost like they become your best mate. Don’t tell me you have never spoken to a Carp when feeding it, or am I the only odd ball? It feels more respectful to the fish on Weston giving them their space in the hope that one day the lake will in return reward my approach. After lightly feeding a few spots I had a bit of a social with some of the other members who were also trying to end the season on a high. There’s a really good group of lads on Weston so after a catch up over a brew I returned to one spot and observed a good size fish coming out from a rhododendron bush. 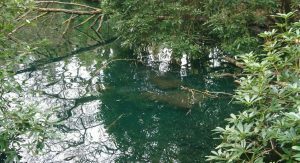 I watched the fish swim through a sunken tree, then out to a small open (snag free) area before returning back under the rhododendrons. Sights like this are mesmerising on Weston due to the water clarity and how dark the fish are. It’s very easy to forgot you’re there to actually catch one when witnessing such sights. To get to this spot I had to push through thick forest so believe me it isn’t the sort of area you can get much tackle to. The rods I use for stalking are the six foot Nash Sawnoffs. Due to their size and power they are small enough to sneak through the heaviest of foliage and strong enough to deal with close quarter combat from Mr Carp. I won’t bore you with rig bits as I’m sure we all know how to tie a Carp rig, plus that’s not really what I’m about. I’m more about simply going fishing, having an enjoyable time and grateful that some people ask me to share my experiences. Although, there is a little something I do differently with the lead system which you might like to try if you’re up for a bit of fun. Instead of a lead clip I attach the lead to a Nash Chod Bead which turns the whole system into a running rig. Thread the Chod Bead on to the line followed by a Shock Bead pushed over the swivel as per the picture below. Really quick and simple. Anyway, back to this fish I’ve seen. After watching him patrol the same features a couple of times I introduced some freebies to the open area between the sunken tree and the rhododendrons. I'm truly struggling to do this sight justice if I’m honest. 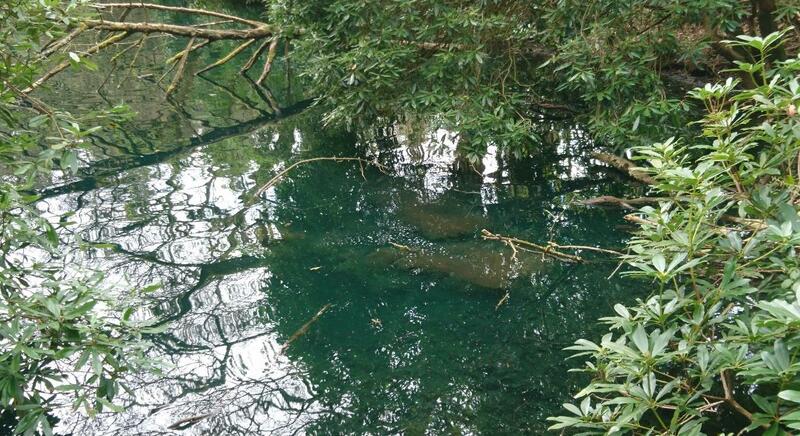 It wasn’t a case of the fish swimming round in circles aimlessly, it was a small area that had the carp grubbing about, taking in some sun, playing with floating leaves and then returning back to the rhododendrons some 40 or 50 minutes later. I also can’t express how frustrating it was when he avoided my popup several times knowing it would be the best part of an hour before he returned. On the flip side it was just as exciting watching the fish grow in confidence each time it visited the baited spot. You can see the Carp in the picture below if you look carefully. The first time it came to investigate the bait presentation it completely ignored a white popup and the free offerings. The second time it ignored a pink popup but still took the free offerings. 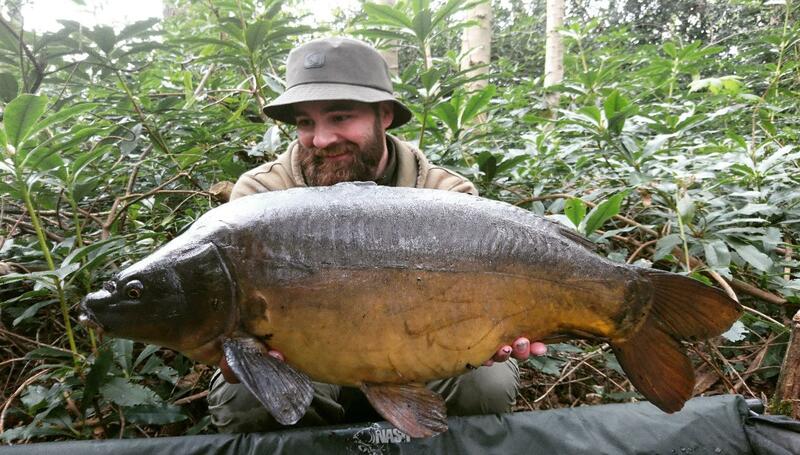 However, on its third visit (some three hours later) it took a fancy to a 10mm yellow Citruz popup. 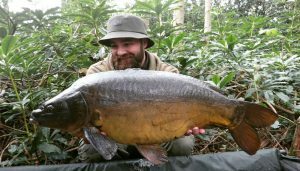 I was lucky enough to actually catch the run on film and looking back at the footage you can hear how the alarm and the fish reacts to the Chod Bead lead system. The footage is quite exciting! While the spot in the lake was clear from any foliage playing a fish in a small area that you can hardly stand up in was made relatively easy due to the size of the Sawnoffs. If you haven’t experienced stalking a Carp on these rods you truly are missing out on such an exciting angling experience. For me they open up a whole new variety of fishing due to how compact they are and the areas I can get to when using them. I’ve caught a number of beautiful fish on Weston but this was quite a fitting way to conclude my season. My favourite type of fishing on my favourite lake. I’ll be back on there in a few months and might even see some of you there. Thanks for reading.